Each month I will offer my advice to help you make the most of your home on a budget. I started out with resources nowhere near in the realms of these uber styled rooms you see in magazines and online. However, I didn’t let that stop my desire to create something as luxe nor should it you. Take the inspiration you see and run with it, just remember to add your own personality and go with what YOU love. Always stamp your unique identity in the finishing touches. 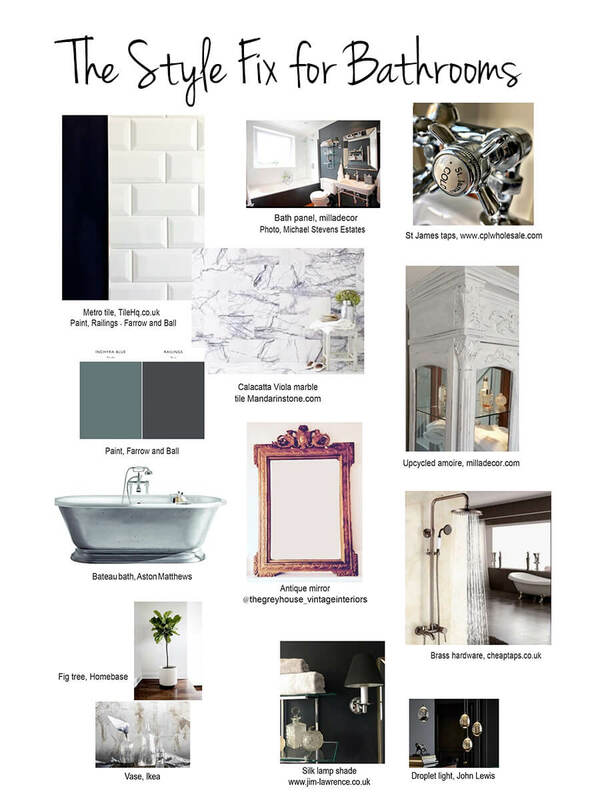 Today I want to focus on creating a bathroom that you thought you could never afford but by following some of these guidelines you will be amazed at what you can achieve with a limited spend. There are a few basic elements that each bathroom requires, and then there are the comforts that make it special to the owner. Be prepared to do the legwork and seek out some bargains. A lot of your time and money will be spent choosing your bathroom furniture and ceramic ware. 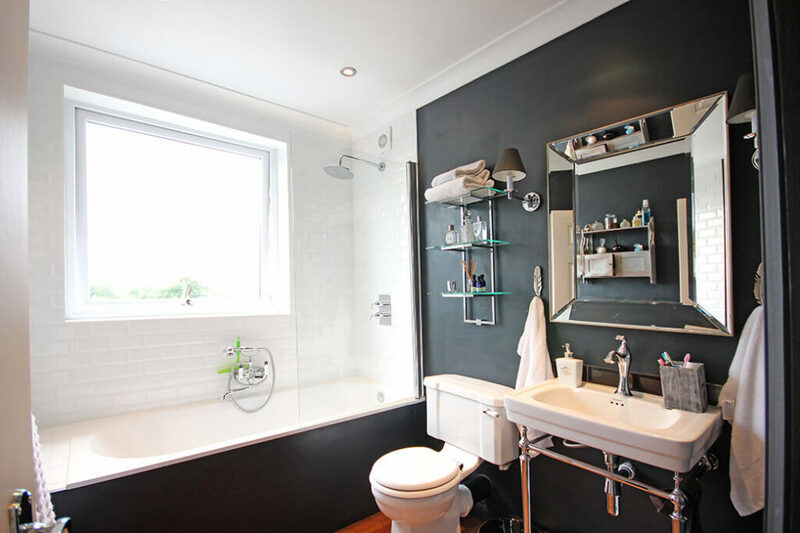 It is crucial that as much effort is put into selecting the smaller fundamentals within your new bathroom. Taps are more than just a final touch, they must be of the best quality you can afford. Consider when choosing your tiles as it is essential they complement each other. Make sure they are in a style thats in keeping with the overall look you want to achieve. For a more traditional feel choose warmer metals like nickel, brass or copper and leave your pipes on full display. Consider a more burnished finish for an antique look. Conceal your shower mechanism behind walls for a contemporary bathroom, and choose a chrome finish or black. I picked up floor standing ex display bath taps by St James from CPL wholesale in East London with 80% off. Often just calling around and asking if they have anything ex display will save you time traipsing around. Always ask if they’re planning on redoing their display. This will mean that all current display will be up for sale. Just bide your time in order to walk away with a steal. You should invest in timeless white sanitary ware meaning you won’t have to update your bathroom in a few years. This doesn’t have to cost the earth but it is essential to spend your money wisely here. Anything that has a lot of use needs to be up to the job. Many independent retailers offer absolute bargains off their shop floors. Contact your local plumber’s merchant if they have a showroom. I made a trip to Aston Matthews‘ warehouse in East London and picked up a cast iron roll top (and a sink) retailing at £1400 for £400 due to a tiny flaw in the enamel, yet to be seen it’s so small. C P Hart also have a clearance warehouse in Waterloo, well worth a trip. Time and time again I’ve come across the same old problem of finding a bath panel that works with the style of the bathroom rather than just filling a void. If you are on a tight budget I can guarantee you will be given the choice of ‘meh’ versus ‘meh’. I’ve overcome this by having a timber merchant cut a piece of marine ply to my dimensions for £50 (marine because it’s completely waterproof). It is then sanded within an inch of its life before being painted and sealed. Your bath is then the focus not the hideous white plastic budget panel!!! Your carpenter can build you a frame to fix the panel too. Tiling an entire bathroom is costly and not always necessary in areas of the bathroom other than around the bath and shower. Metro tiles are classic and inexpensive. Use with bold paint colours to add texture and contrast for a fraction of the price. In addition to this, highlight a small area on the floor or wall, either under a freestanding tub or a splash back and utilize this small area to make a massive impact with a beautiful more costly tile that you simply wouldn’t be able to afford if used in the entire room. Calacatta Viola from Mandarin Stone is a beautiful marble tile. Inset this with a wood floor under a freestanding tub for example. Marble is a beautiful material to use in bathroom design, as nothing states luxury and opulence like it. It is hard wearing and versatile but porous so ensure it is sealed and cared for when used for this purpose. If all of the above is beyond your reach and you can’t replace, then try resurfacing. It’s a simple and affordable alternative whereby tiles and grout are repaired and resurfaced in any colour. This method can also be used on sanitary ware. Introduce something antique. If you have room, choose an armoire to store linen and display trinkets. The white canvas of your bath suite lets the accessories speak in a way that really represents you – and of course, you can change the look again whenever you’re ready. My go-to for vintage pieces is @thegreyhouse_vintageinteriors, who can source for you. It’s so important to have living things in your house, and great plants will help tie everything together. Place them in beautiful antique pots. It brings a freshness to pieces from any era, and manages to add some richness to modern pieces as well. Be adventurous with lighting. Use pendants either side of the mirror as an alternative to wall lights. Or opt for a simple inexpensive wall light and dress it up with a more expensive silk candle shade. Adding richer textures creates this more opulent feel so don’t be put it off just because it’s a bathroom. These often luxurious settings provide a refuge from our ever busy lifestyles and a place for pampering, so why not do it in luxury. Credits: Written and curated by an interior stylist Ruth Daniels from Milla Decor, please follow Ruth on Instagram @milla_decor. Cover image of Ruth’s bathroom by Michael Stevens Estates.